A day in the world around me!! : LIFE! My flickr group Orange You Glad has felt the "wrongness" of my "life". First, Marta's block was returned to me, I need to pay more attention (plus I got my eyes checked and needed glasses!!) I put the wrong zip....but thankfully it has be remailed to her and hopefully this time it makes it! 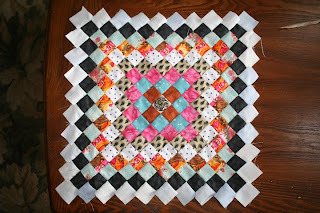 I really love this block.....I am making my husband a postage stamp quilt, only I am doing it all by hand. I started it last January. I know you would think it would be done by now, and so does my husband but it is 1-1/2" squares and 18 rows! Plus it has to fit a king size bed.......yes, crazy! 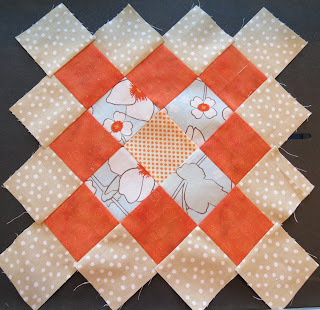 I have decide that the borders would be an ecru color and I am quilting as I go. 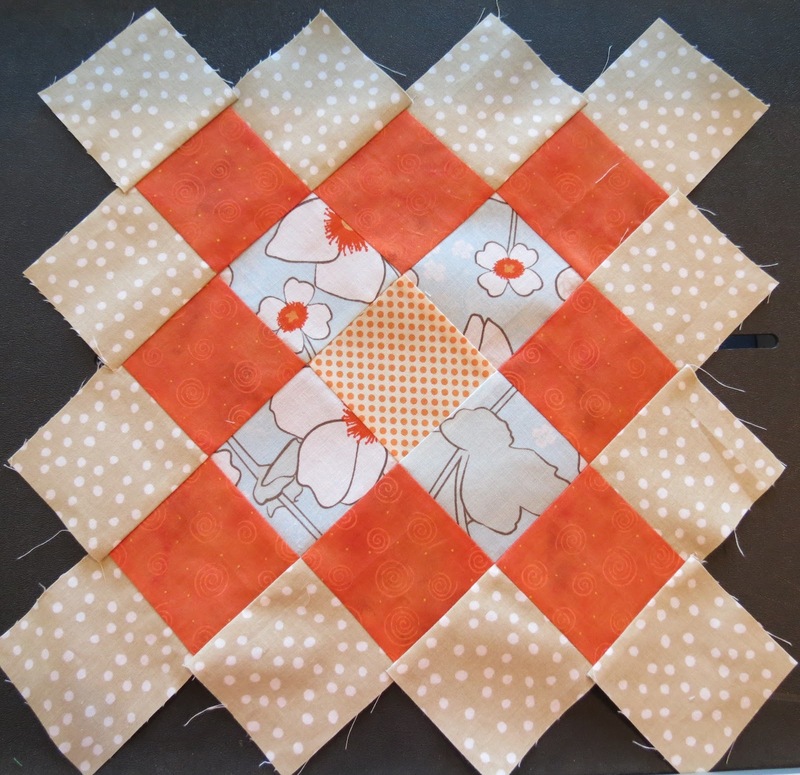 I have 5 more blocks to make......then the quilting and joining. I wanted to get it done by his birthday in October but that just ain't going to happen......maybe Christmas. Then Shawn's squishy got lost coming to me! To my surprise to showed up today. It is a pretty awesome block too. 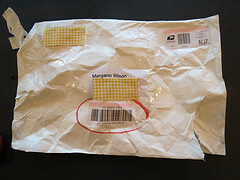 Thankfully it arrived unharmed......well the good stuff anyway! I have starting working on it right away. I am trying in vein to get this out by the end of the month so that I am not late!! Should work, as long as I do, lol! 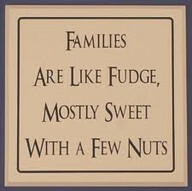 My poor husband STILL has his nights and days mixed up, poor guy! I am not sure what we are going to do about this. It has affected my sleep and for the past month I would lay down with him in the afternoon for a cat nap, that turned in to a couple of hours! Needless to say I didn't get much done. I finally told him I had to put a stop to that. 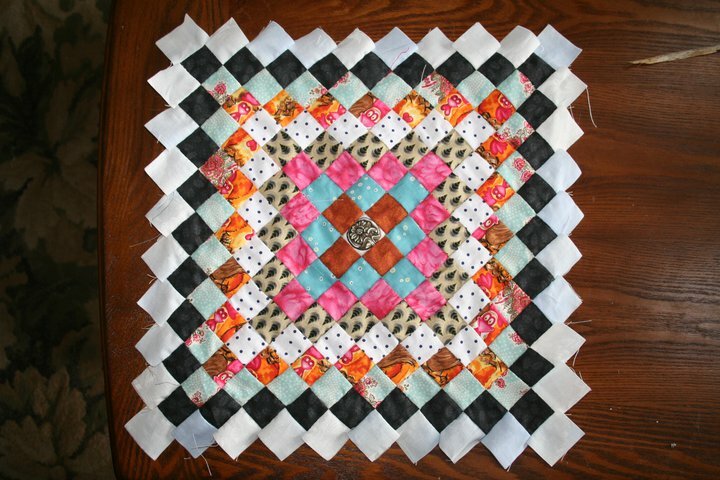 Beside falling behind on dusting, laundry and other household chores that I hate, I was falling behind in my sewing. Yes he is more important than the house work, and my theory is "if you don't like my mess, don't visit!" (and really it's not that bad, my girls always help me out when they are here). But, sleep can not come between me and my machines!!! And yes, the swing set is finished! Bryce, Shayne, Belle and Hayden. We forget to get a baby swing! See, once again, life. I am really glad we got it and its together, the kids love it! So with my life a little more on track I hope to keep all of you more updated. Hang in there, it has to get better! !